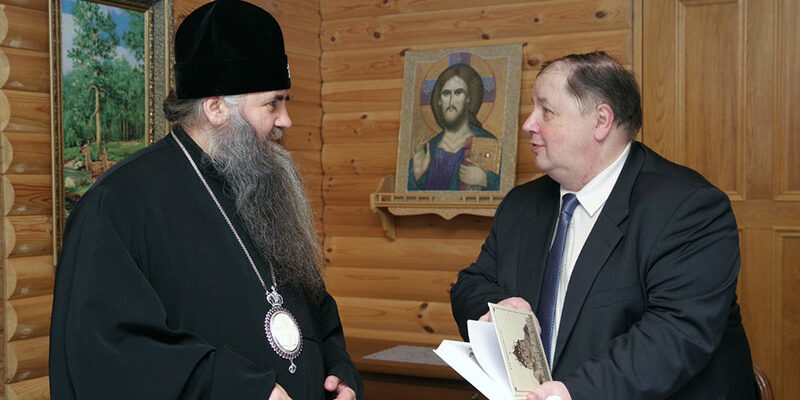 Metropolitan Georgiy of Nizhny Novgorod and Arzamas and Dmitry Olegovich Shvidkovsky, member of Patriarchal Council on culture, President of Moscow’s Architectural Institute, held a meeting in Seraphim-Diveyevo monastery. Architects from Moscow made a 3D presentation of their Diveyevo monastery’s layout design project, as well as one for Sarov monastery and downtown of Arzamas. Renovation projects are slated to implement the federal project development of “Arzamas-Diveyevo-Sarov” pilgrimage and tourism cluster. Hegumenia Sergiya (Konkova) and Protopresbyter Sergiy (Matveev), Nizhny Novgorod’s Diocesan Secretary, took part in the meeting.